The Hatfield Heritage Trail consists of ten boards placed around Hatfield starting outside the University of Hertfordshire. Each board is in a relevant location and provides information on Hatfield’s remarkable history. The trail is a way for the local community and visitors to explore and learn of Hatfield’s heritage and show off its significant aviation history. In November 2010 the Hatfield Heritage Trail was opened and to mark the occasion a number of people, including myself, were given a short tour of a few of the boards. This tour included a short walk to where the gatehouse used to be located and to the old administration building. The boards cover a number of topics including the beacon, rocket development, Astwick manor and the early years of the aerodrome. Interested in walking the trail? 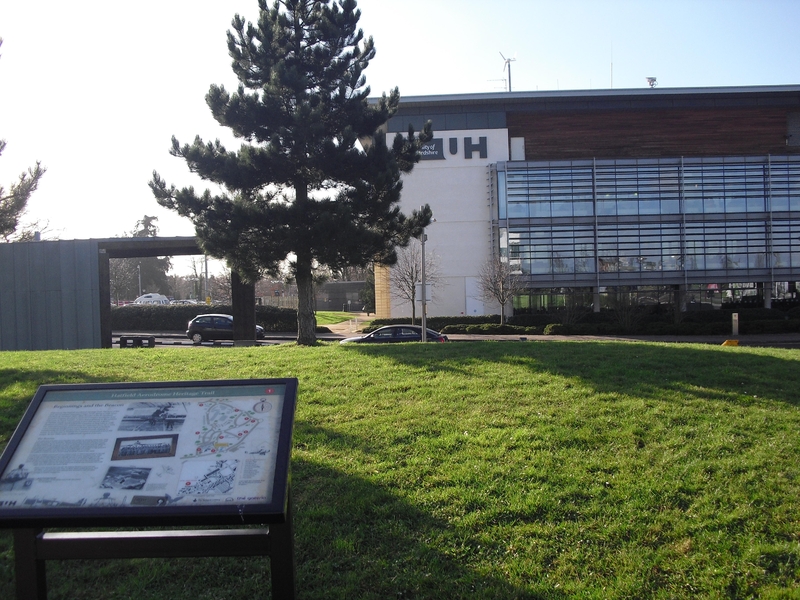 Leaflets about the heritage trail including a map to guide you around the boards will be made available from the University of Hertfordshire and on the university’s website soon. There is also a shorter trail highlighted on the map which covers a smaller area and only a few of the boards.